The top iOS and Android app for live music from the world's greatest bands, including Metallica, Bruce Springsteen, Pearl Jam, Phish, Red Hot Chili Peppers and many others. nugs.net started in 1997 as a web-based fan site for downloading and buying live music. 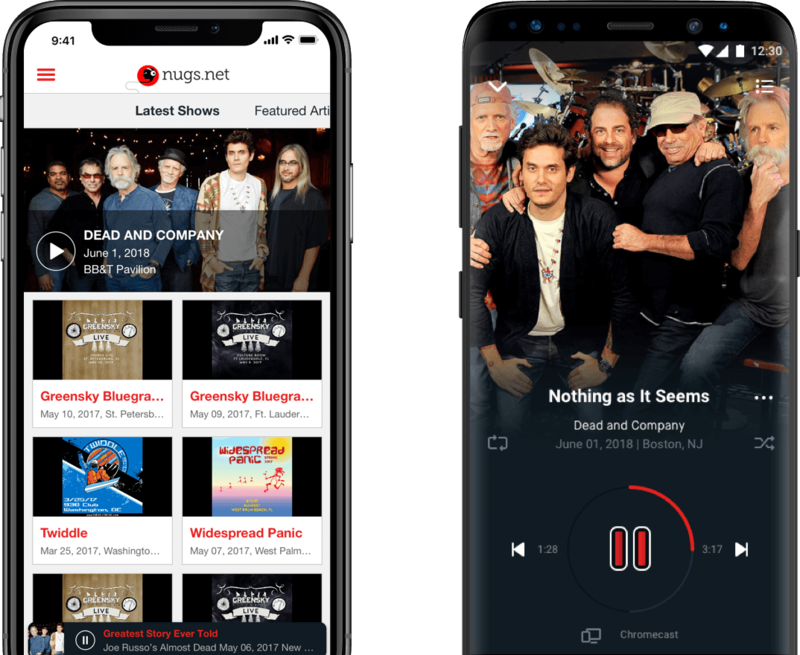 As the music world evolved to be more mobile and subscription-based, nugs.net knew they needed to evolve their business model toward gapless streaming of high quality audio and video to passionate subscribers. And they needed a high quality partner to help. In a world of lookalike music apps, nugs.net needed a distinctive look for web and mobile. It also needed user design that made it easy to find, sort and listen to tens of thousands of artists and concerts. If you’re going to be the best in the business with exclusive live concerts, you might as well go all the way. So nugs.net and Reinvently added online streaming of live HD audio and video performances, with shows from “all over” in real-time - bringing a whole new meaning to webcasting. That much HD audio deserved more than headphones. With their fanatical obsession about quality, linking nugs.net to Sonos wireless home sound systems made perfect sense. But it wasn’t trivial, requiring lots of technology know-how from Reinvently to make it all work absolutely perfectly. Never stop improving. With its artists producing exceptional quality live recordings, it made sense for nugs.net to add lossless audio to its subscription service. But adding HiFi streaming via both web and mobile wasn’t about showing off: it was about the music and creating the best User Experience. The bands featured on nugs.net don’t just play great music. Their shows are total experiences … and that’s why adding Subscription Video on Demand (SVOD) made perfect sense. Reinvently and nugs.net worked together to update their web and mobile apps to enable a flexible subscription business model that supports the wants of users and bands alike. Looking to Build a Music App? Audio technology continues to improve, and MQA provides a new way to capture the original performance with incredibly high quality playback. So Reinvently worked with nugs.net to add MQA playback to their iOS app - one of the first implementations of MQA on Apple devices. Now, nugs.net subscribers can enjoy MQA playback on thousands of full length concerts. What’s life without choice? Now, Reinvently and nugs.net have added integration to an array of external devices from the nugs.net app. This includes support of AirPlay on iOS and Chromecast on Android. Subscribers now can watch pay-per-view concerts, including nugs.tv streaming, on their home theater systems. While concerts are huge fun, nugs.net is serious business, and Reinvently is constantly using analytics we’ve built into our apps to consult with nugs.net on product improvements that can improve user acquisition, activation, retention, revenue and referrals. Operationally, the nugs.net service is a team effort: Reinvently designs and develops the apps, while nugs.net handles its own backend and e-commerce. Together, we’ve developed a great and close relationship while building and expanding the best live music product in the world. So we’re always ready to support nugs.net anytime, including issues related to nugs.net's own software and infrastructure. We also administer third-party tools, resolve issues and negotiate with folks like Google, Facebook, Apple, MQA, Sonos … and the list keeps growing.